Alex Katz, in the words of Guy Tosatto, is “one of those artists that can really only be defined by listing the movements he hasn’t belonged to”. Alex Katz, born in 1927, lives and works in New York. He has drawn inspiration not only from the painting scene, movies and billboard advertising, but also from the European painting tradition, with stylistic echoes ranging from Ingres to Matisse. Katz’s work feeds on ambivalence, whether in his choice of subject, which essentially alternates between landscape and portrait, or in the way he represents the subjects, which oscillate between figurative for the subject and abstract for the background. For all that, there is, and always has been, an unbroken sublimation of beauty in his work. 45 Years of Portraits. 1969-2014 brings together some one hundred works and includes historic paintings from the 60s and early 70s, as well as more recent works from the 80s to the present day. 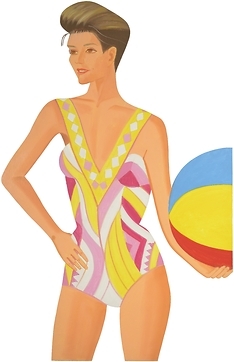 There is a large-scale paintings, more intimate and cursory sketches, but also a less well-known and less often exhibited part of Katz’s oeuvre: his ‘cutouts’. These works, hung like a painting, are cut out of a painted metal support and have the appearance of autonomous silhouettes detached and floating in the composition to complete the autonomy of the figure. While on the one hand the ‘cutouts’ remain two-dimensional in the way the line is inscribed into the plane and its relation with the surface, they nonetheless take on a three-dimensional quality in the compositional interplay of empty and filled space, thus acting as a link between Katz’s painting and his free standing sculptural cut-outs. Beyond the idea of a linear retrospective, the format for this project seeks to emphasise the interaction of the various supports in Katz’s creative process and to choreograph the artistic tension this interaction produces. The decision to juxtapose works from different times in his creative life gives rise to a narrative semantic space between the works and the periods. The thematic thread of the exhibition is the ‘figure’, which can be taken to mean outline or shape, or just line. A large part of Katz’s work focuses on reproduction or representation of the body and the portrait. 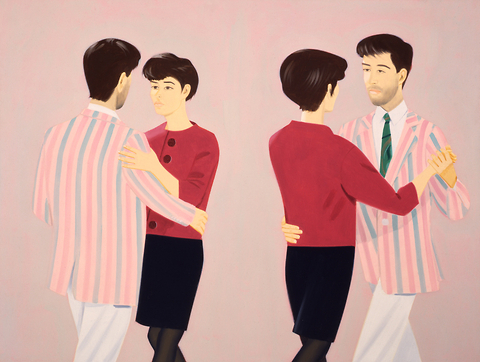 Alternating between male and female sitters for inspiration, Alex Katz mainly paints family and friends. 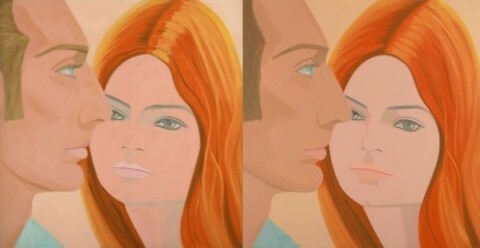 Over the years he comes back again and again to his favourite models, repeating himself as in mechanical reproduction, even multiplying the subject like in the double portrait Laure and Alain, where he juxtaposes a panel from 1964 with another from 1991. They are similar in composition and in choice of subject. This urge to redo a work in exactly the same way has the advantage that it provides a way of seeing how his painting has developed over time.